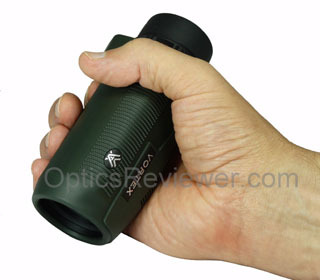 The Vortex Solo monocular attracted our attention as longtime monocular enthusiasts. 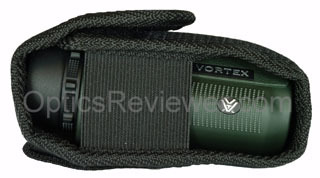 The configuration that really caught our attention was the Vortex Solo 8X36. With the larger 36 mm diameter objective lens it would naturally provide a better image in terms of brightness and contrast, all things being equal. The more generous 4.5 mm exit pupil and excellent 393 foot field of view at 1,000 yards (131.4 m/1,000 m) would also be a plus. At just under 10 ounces or 290 grams, it's light enough to forget that you're carrying it around your neck, too! To satisfy our curiosity about the Solo 8X36, we ordered one. With all this going for them, we dug in to see what the Vortex Solo 8X36s were like. First of all you'll find that size-wise the Vortex Solo monocular fits easily and comfortably in your hand as it comes in just under five inches long. As is the case with most optics these days, it has a layer of rubber armoring to protect it against accidental drops and bumps. Although it's a little larger than some have said they expected it to be, please remember that you're still getting 8X36 performance at less than half the weight of an 8X36 binocular. We like that part! The Solos with 36 mm objectives, but not the 25 mm configurations, include a clip that's handy for putting them on your belt, or shoulder (or sternum) strap of your back pack. Our preference is to carry a monocular on a lanyard/neck strap (both are included) around our neck and tucked into a pouch or pocket that will protect it from debris. Others find the belt clip handy and use it extensively. If debris on the lenses is a concern while using the clip, just put a soft cloth over the ends and hold it in place with an elastic or rubber band. For the negatives regarding the Solo case's open sides, there is a significant positive. The open sides at the bottom of the case mean that the twigs and other debris that often gets into the bottom of a case can easily be knocked/pushed out the sides and thus avoid scratching the objective lens. Whether the positives or the negatives are more significant may depend on how you expect to use it. Also, the 8X36 Solo just fits nicely in the case and, with the top snugly closed over the top, the probability of matter settling on the ocular lense is not as high as would be the case if the Solos did not fit snugly. For carrying inside your pack or luggage, we recommend something like a small toiletry travel bag or, if you're like us, slipping it inside a large, clean, soft sock - case and all. The Vortex Solo monocular is both waterproof and internally fog-proof. If you go from an air conditioned area to a humid one, you're still likely to get fog on the exterior surfaces of the lens system. Likewise, when you put it to your eye in cold weather, you may see a thin fog on the outside of the eyepiece. (This is normal with all optics - we're not singling out the Solo here.) The waterproof sealing will prevent moisture that causes internal fog, however, and that's what has led to the ruin of many fine optics! To achieve the 8X36 Solo's weight of 9.7 oz (275g), the body is made of polycarbonate. It's a tough plastic that's widely used to achieve a durability with light weight. It seems quite reasonable to think that most of the Solo's weight comes from its lenses and one wouldn't want to cut weight there! The Solo eyecup is a twist-up -down style and we think it's comfortable. It has two positions, fully down and fully up. It will help both those who do and don't use eyeglasses to be comfortable. It does not stay put as well as the eyecups on the Viper HD or Razor HD binocular, but it is serviceable. It would be good if Vortex were to improve this to be in keeping with the overall quality of the Solo's optics. The close focus is a little more than 16 feet, so you'll not be able to use it for close-up observations of nearby butterflies or insects. On the other hand, its 18.0 mm eye relief should make it comfortable for most eyeglass wearers and the depth of view (depth of distance you can see plainly without needing to re-focus) makes up for the close focus factor. Does the Solo have a Fast Focus? The number of revolutions of the focus wheel to go from close focus to infinity for a binocular is best, in our opinion, at about a single, full revolution of the focus wheel. Anything less (or a "faster focus" to say it differently) usually means we can't achieve a fine focus without spending time fiddling back and forth. Anything more than 1.5 revolutions of the focus wheel means we'll be spending more time turning the focus wheel than absolutely necessary and wearing out our fingers. This is especially true with the shallower depth of view a roof prism provides and if we change the distances over which we're viewing images many times during the day! Given that background, we were a bit surprised to find the Solo goes from close focus to infinity in about a quarter turn of the focus wheel. It may be that this design was created with the person in mind who doesn't often change the distance over which an image is viewed or who may be viewing activity which changes distances particularly quickly. How about the Usable Amount of the Field of View? 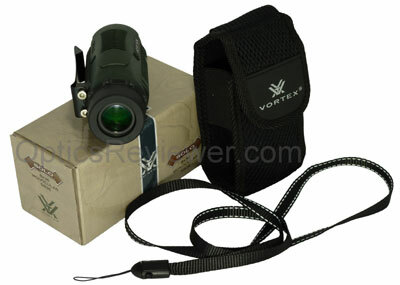 The Vortex Solo monocular's 8X36 configuration's field of view (393 feet at 1,000 yards, remember?) is good. We wondered how much of it would actually be usable before focus was lost around the edges due to curvature of the lens. Our testing showed that viewed images were sharply defined from the center of the field of view to about 67&percnt; of the radius before the details started to soften slightly. The details in the last 22&percnt; of the radius (in from the edge of the field of view) were noticeably fuzzy. The Solo has a very small amount of pincushion distortion designed into them to prevent the rolling-ball or globe effect distortion, as do most binoculars and monoculars. It's not likely to be apparent to the vast majority of users, however, since we had to look specifically for it during testing. What about the Brightness in Low Light Conditions? We found that the 36 mm objective allowed significantly more light in than the usual objective size of 28 mm or less. The brighter picture enhances the viewing experience considerably, particularly in low light conditions when compared to smaller monoculars. What about the Solo's Optical Coatings? The glass is fully multi-coated and will deliver a bright image to your eye. All Vortex optical products are made with BaK-4 prisms - which gives them a distinct edge over those which are not. For those who wonder, the Solo prisms do not have a dielectric coating - however the 36mm objective and 4.50mm exit pupil combination provides a bright image with good contrast. We did observe a modest amount of chromatic aberration with our test Solo, but not to excess and certainly not to the extent that it would be likely to be troubling in the field. 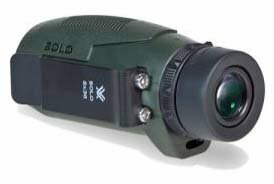 We're comfortable recommending the Vortex Solo monocular as a good value for the price for those who can use a fast focus. Hunters, travelers, and more will find a trusted optical companion in the Solo, although the especially fast focus may limit its practicality for birders, stadium sports enthusiasts, and others with similar uses. We feel that the combination of fully multi-coated optics and the 36 mm objective lens provides a very nice, bright, image with good contrast, color fidelity, and resolution. Each of the Vortex products comes with an unlimited, no-fault, lifetime, transferrable warranty. We don't know of a better warranty. You can check the Solo monocular's availability and pricing (and customer comments!) at Amazon.com and at Amazon.co.uk .